Nearly 50% of children will have some type of injury to a tooth during childhood. Many of these are preventable. While most traumatic injuries occur in children and teenagers, people of all ages can be affected. We see tooth trauma from all sorts of situations such as falls, sports injuries, playground injuries, fighting, car accidents etc. Accidents happen, and knowing what to do can be the difference between losing and saving the tooth. If you or your child has had a permanent tooth knocked out it is important to remember that the sooner it is back in the mouth the better. This is because root of the tooth is covered in cells which need to be kept alive in order for the tooth to reintegrate into the mouth. The tooth should be placed back into the tooth socket as soon as possible, ideally within 15 minutes. At least 85 percent of teeth that are put back in the tooth socket within five minutes survive, compared to very few teeth that are stored dry and re-implanted after one hour. This is why it is so important that you know what to do if the situation should arise. Pick up the tooth by the crown (the part we see in the mouth). Do not touch the root. If the tooth is clean reinsert it into the socket. If it is not clean, rinse it quickly and carefully ideally with milk, saliva or saline and then reinsert. Never scrub it. Keep it in place by biting on a clean hanky or flannel. If you can’t place the tooth back in the socket, place it in a small container and cover it with milk. Another option is to place the tooth between the cheek and gums. This option assumes a child is old enough to avoid swallowing or spitting out and losing the tooth. If milk is not immediately available and/or the child is too young to hold the tooth in their mouth, you can put it in a container with saliva. Do not store the tooth in water, because this will reduce the chances of successful healing of the re-implanted tooth. Broken permanent teeth can usually be repaired successfully. Tooth fragments should be saved if possible, as they can sometimes be reattached. If tooth fragments cannot be found or cannot be reattached the tooth may be repaired with a composite material (the same material used for tooth coloured fillings) which can be matched to the colour of the natural tooth. If a large section of the tooth has broken off, an artificial tooth crown may be needed to restore the tooth. 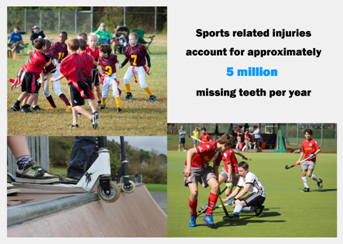 Around 40% of injuries to teeth happen during sports. Dental trauma is never planned but the risk can be reduced. We recommend that anyone involved in sporting activities gets a professionally fitted mouthguard to prevent the occurrence of dental trauma and knocked out teeth. We can create a custom fit mouthguard based on an impression taken of your teeth, giving you a mouthguard that fits perfectly around the teeth offering significant protection. We recommend wearing a mouthguard for any sport that involves falls, body contact or flying equipment. This includes hockey, rugby, cricket, football, martial arts, basketball, skateboarding, gymnastics, mountain biking etc. Our mouthguards are suitable for children and adults. A gap in your teeth that comes from a knocked out tooth might cause concerns about your smile. If the tooth cannot be re-implanted there are many cosmetic options to replace missing teeth, such as removable dentures, a fixed bridge and dental implants. Your dentist will discuss the different options with you.